With over 16,000 solar panels and producing 3 MW, the Exelon-Epuron Solar Energy Center is the nation's fifth largest solar photovoltaic generation project, and is behind only projects in the solar hot spots of California and Arizona in size. Generation, Epuron, Conergy and Waste Management Inc.-to make it a reality. The State of Pennsylvania is no stranger to the energy business, old or new. In 1859, the Seneca Oil Company struck oil in Titusville, Pennsylvania, and the modern oil industry was born. Pennsylvania was suddenly a key player in the energy business. But the oil soon ran dry and the state's energy heydays became a piece of history-until now. Epuron LLC, one of the world's leading project development and structured finance companies in renewable energy, for the energy produced at a solar power facility recently built in Falls Township, Pennsylvania. The Exelon-Epuron Solar Energy Center is the nation's fifth largest solar photovoltaic (PV) generation project, behind only projects in the solar hot spots of California and Arizona. It has over 16,000 solar panels and produces 3 MW-enough energy to power between 350 and 400 homes. The approximately $20 million project-coming in on time and on budget-was built adjacent to a large Waste Management landfill outside Northeast Philadelphia. Exelon was familiar with Waste Management, and the landfill. It has a power plant that uses gas from the landfill. It sounds like a pretty straightforward deal, but Mike Freeman, senior originator for Exelon, said this project required timing, inspiration, and incredible teamwork between multiple companies to make it a reality. Exelon has been in renewable energy markets since 1998 and has an extensive renewable portfolio. 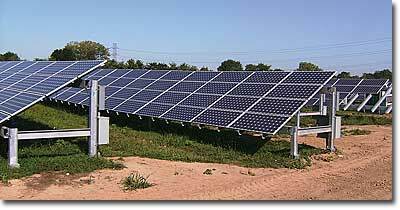 And when Pennsylvania, New Jersey and Maryland created incentives to construct solar energy plants between 2002 and 2005, the company took notice. "I thought there might be something there," says Freeman. "Solar RECs (renewable energy credits) were trading very thinly in the over-the-counter market, but there was a little volume and we thought maybe there's a way of getting involved and making some money." Fast forward to 2006. Freeman received a phone call from Sarah Hetznecker, a co-founder of Mesa Environmental Sciences. "Sarah asked if I would be interested in looking at an off-take opportunity for a solar plant. I had been thinking about it, so I said, sure, let's talk," says Freeman. Sarah came to the company's offices in Kennett Square, Pennsylvania and laid out the plan-a rooftop site in Philadelphia. "It was an enormous rooftop and they thought they could get 3 MWs of panels on to it. I was interested but I didn't know whether they could get financing." Talks continued for a couple of months and during that time Conergy-a large German renewable energy systems company-announced it was going to locate Epuron (its financial arm) in Philadelphia. It also announced that it was buying Mesa. "Mesa was becoming an installation and engineering subsidiary called SunTechnics. So I was still talking to the same people," says Freeman. "But now they were joined by people from Epuron," who represented the financial piece to the puzzle. Epuron took the lead in negotiating the deal, but in the spring of 2007 the rooftop idea fell through because of the reinforcements the roof would require to carry the weight of the solar panels. The lack of a rooftop didn't stop anyone. "We started looking around for other sites and eventually a contact put SunTechnics together with Waste Management, which has a huge landfill outside Northeast Philadelphia." says Freeman. It had a 20-acre site sitting idle. Freeman's team at Exelon was no stranger to Waste Management. "We have a power plant out there that uses the landfill gas and so we were very familiar with the area and the landfill, and we already had a very close and longstanding commercial relationship with Waste Management. So when they came up with that site, for those reasons-but also because this land wouldn't be used for anything else-I thought it was a great example of a siting decision for solar." Everyone moved ahead on the project. While Epuron and SunTechnics (which later was branded as Conergy) worked with Waste Management on the lease agreement, Epuron and SunTechnics also worked with Exelon on a power purchase agreement (PPA). By July 2007, the lease agreement was executed and the PPA was executed a month later. "It moved pretty fast," says Freeman. "It was an interesting process because we had never done a solar PPA. We've done four wind PPAs, and there are some similarities, but solar has some interesting twists. For example, how you define availability. As an off-taker you want some understanding of what quantity you're going to be receiving every year. "We had to come up with some method of getting the output guarantee that I was looking for, but still not hold them to an impossible standard because cloud cover is out of their control. Making both sides happy took some time." SunTechnics, designer and builder of the project, started construction in April 2008 after the final permitting was completed. Even the Pennsylvania Governor came out to help break ground. The project had a construction timetable of 150 days and was scheduled to be operational in September/October 2008. At the end of this past summer, 17,000 cells had started producing energy. The energy produced goes into an interconnected transmission network that serves this region. The approximately $20 million project is coming in on time and on budget. Pete Alyanakian, Epuron senior development manager, says the company is extremely proud of the project. Anywhere where there are idle assets that can be re-created and re-developed into a green space of renewable energy-right adjacent to a landfill-"it's a great story." "The fact that two Fortune 500 companies like Waste Management and Exelon had the vision to see the future-and to look at themselves internally and to buy into the concept that doing the right thing and doing it in a way that was very well thought-out and profitable for both companies-demonstrates the viability of the technology in the future, and the viability of doing a project of this magnitude." The project was so successful that Exelon has already entered into another in South Philadelphia on the Delaware River. Construction of the 1.3 MW plant should start this fall. "Once you get all the permitting and the site prepared, it moves very fast," says Freeman. "The biggest challenge is finding a suitable site. It's not like a conventional power plant siting where you go through a lot of time and effort trying to figure out whether you can actually build a gas-fired plant at a particular site, and you can't do anything until you are absolutely sure you can do it. That's not necessarily the case with solar. "You go through the process to a certain degree, satisfying yourself that based on cloud cover data, the site, and the landowner, you could go ahead with this. And then you move ahead. That took a little bit of getting used to for me." With people worldwide trying to make solar modules more efficient, and a guarantee that projects in the near future will be more efficient, is Freeman concerned about entering into a 20-year lease? That he could have built a more efficient plant if he waited? "That's one of the issues right now with solar. People are reluctant to invest in a big way right now with technology improvements coming down the pike," says Freeman. Conversion efficiency today is around 15 to 16 percent, in terms of energy produced to sunlight taken in. Companies are working to increase that to the low 20's. And at some point, a site the same size as the Waste Management site could produce 5 MW or possibly even more. "Does someone want to get deeply involved with solar when it might be 50 percent cheaper in eight, 12 or 15 years? When it will be cheaper and more efficient?" says Freeman. "It's a tough call-but we think there's a market for it now, no matter where the technology is going. And we think we can make it work, not at hundreds of megawatts, but certainly at tens of megawatts." Freeman believes solar PV will become very big in the U.S. "I believe it will be a mixture of plants like this one and many small rooftop installations on homes and businesses," he says. "I think it's going to get to the point where you'll be able to go to places like Home Depot and buy a PV system and they'll install it for you. The economics will be such that it will be a fairly easy decision. It may take 10 to 12 years to get there based on what I'm hearing, but I think it's going to be big."